Reviewer’s Note: The game was received for review purposes. It was played on the Xbox 360. The Elder Scrolls series is truly one of the most remarkable and long-lived role-playing franchises in video game history. Bethesda Softworks has continually pushed the realm of high fantasy into new and faraway vistas, expanding upon the foundations of each chapter like the building blocks of towering castle wall. Arguably the most anticipated RPG of the year, the fifth installment of The Elder Scrolls universe has culminated into something that’s more than just a game: it’s a massive and dynamic world replete with lore and adventure that defines the role-playing genre in itself. The sheer epic scope of Skyrim’s makes it Bethesda’s magnum opus which will leave an unforgettable impression on the gaming world for years to come. The story arc of Elder Scrolls V is a robust and winding path that’s revealed as players progress through the main questline, which is even more dynamic than Oblivion’s. Skyrim makes use of the archetypal Hero’s Journey that has defined the Elder Scrolls series for decades, delivering an authentic medieval fantasy experience that both new players and die-hard fans can enjoy. Two hundred years after the events of the Oblivion crisis, the Empire struggles to recover from a violent and brutal war against the ruthless Aldmeri Dominion. The Great War left the Imperial Empire in shambles, forcing Emperor Titus Mede to sign a punishing treaty known as the White-Gold Concordat in order to maintain peace with the cruel Thalmor dominion. All of Tamriel was affected by the Great War and the Empire’s subsequent surrender to the powerful dominion. Skyrim in particular was one of the provinces most affected, and the treaty itself introduced a new era rife with political strife and religious oppression. The once-united Nordic culture has been fractured and the sons of Skyrim have splintered into two groups: the Stormcloaks who rebel against the cruel decree of the White-Gold Concordat, and the Imperials who simply want to hold the realm together by any means possible. In the midst of bitter political and cultural rivalries in Tamriel’s shattered society, a new threat rises to claim the mortal realm–an ancient power that has laid dormant for thousands of years but has been re-awakened by a prophecy written in the Elder Scrolls. 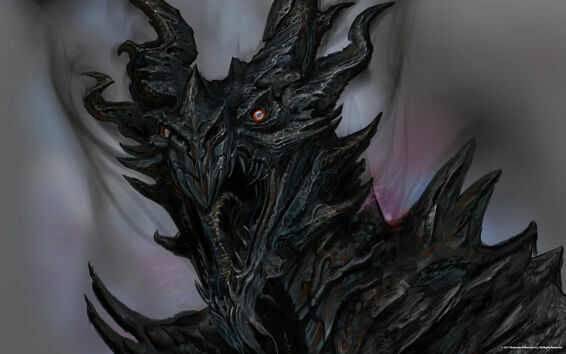 Alduin World-Eater is as fearsome as he is menacing. Alduin, the ancient Nordic dragon-god of destruction, has returned to wreak havoc on the land of Tamriel. The ancient prophecies lamented in the Elder Scrolls told of Alduin’s return, and as evil rises, so too does a hero: the fate of Tamriel rests on the legendary Nordic hero known as the Dragonborn. Armed with the power of the Voice and the ability to absorb dragon souls, the Dragonborn is the only one who can stand against the mighty dragons and stop the World Eater from devouring all of Tamriel. Facing ruin and defeat, the Empire struggles to deal with the civil unrest and the menacing threat of the dragons. As the mythical and heroic Dragonborn, gamers will play a pivotal role in the history of the Tamrielic Empire and in the rise–or fall–of Skyrim itself. Taking a massive leap from Oblivion, Bethesda introduces a completely new and rebuilt system of game mechanics that places emphasis on customization, ease, and personal play-style. Everything from the in-game interfaces and menus to the skill system has been revolutionized to be much more user-friendly and comfortable. Adapting to a brand-new system of mechanics can sometimes be overwhelming, but the transition into Skyrim is quite comfortable. The new interface takes all of the visual frills out of Oblivion’s in-game menus and replaces them with an efficient and easy-to-use omnidirectional scheme. Adapting to the new system feels natural and allows players to easily scroll through and check anything from weapons and armor to quest objectives. Instead of a radial menu controlled by the Xbox 360’s abhorrent d-pad, Skyrim makes use of a Favorites Menu system that is used by pressing ‘Y’ on any equip-able item. The Favorites Menu replaces the Hotkey function in Oblivion and also allows two instant swap slots that are used by pressing Left or Right on the d-pad. This function allows for an instant swap to the assigned item without having to pause in order to navigate the Favorites Menu. Players can assign instant swap items by holding down Left or Right on the d-pad on an item selected in the Favorites Menu. Skyrim's new skill system is infused with signs and constellations. The skill system has been dramatically overhauled and is much more rewarding, and each level-up actually feels important and empowering. There are no more governing attributes, or any attributes for that matter. That whole system has been scrapped, and now players only have Health, Magicka and Stamina (Fatigue). Stamina affects everything you do from running to swinging weapons, and even affects your carrying weight. Magicka is directly correlated with magical attacks and resistances. Having no attributes such as Strength, Luck or Endurance may seem odd to die-hard Elder Scrolls fans, but Skyrim does a great job in balancing the new changes in gameplay mechanics. All skills are divided into three main classes that follow the principal aspects: The Warrior, Thief, and Mage. Each class has six skills that are built up and raised by practicing each required action: for example, to level up the Pickpocket skill, players must go around pickpocketing NPC’s. There are many skills that have been scrapped such as Acrobatics (no more spamming the jump button! ), Althetics, and even the magical school of Mysticism. Skyrim makes up for those missing skills and attributes with the Perk system. Similar to Fallout 3, Skyrim uses a system of Perks that are granted with every level-up. The skills themselves are represented as beautiful constellations fashioned in each of the three main classes–the Warrior, Thief, and Mage–and each skill (Conjuration, One-Handed, Archery, etc.) has its own unique track. Each star in the constellation represents a different perk, and each perk–or ability–has its own specific requirements. Similar to Diablo II players have to unlock the Perks in a linear path, meaning you can’t skip to the best Perk without having the per-requisite Perk already unlocked. The level cap in Skyrim is set at level 50, which means that not all Perks can be learned. It’s important to realize what kind of character you’d like at the beginning. However it can be overwhelming to choose what Perks you want right away. Fortunately, players can save their Perk skills until they’re ready to decide what kind of character they want. Also when a player levels up in Skyrim they must choose to raise Magicka, Health or Stamina by 10 points instead of getting a bonus to all three. The heroic Dragonborn facing a serpent of the sky. 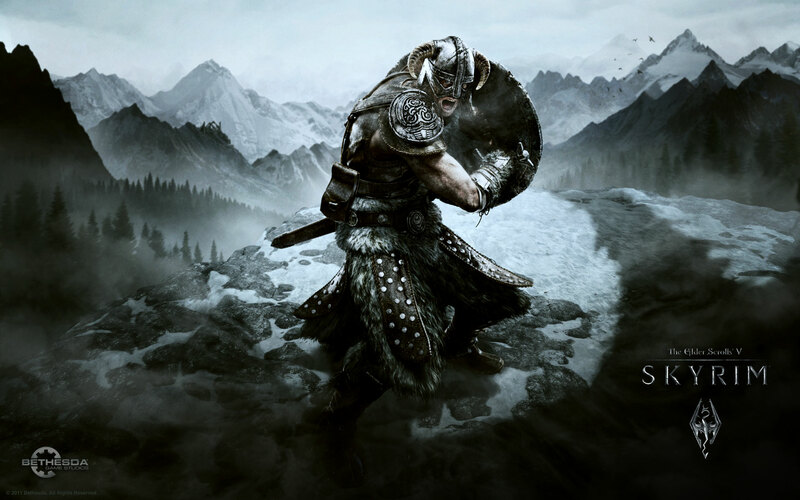 The action-packed combat is one of the most enjoyable and dynamic elements found in Skyrim. Bethesda introduces brand-new mechanics like dual-wielding to make every battle–big or small–feel like an epic duel. Players can make use of a huge variety of weapon types and grades to complement their character type–wherever your character’s proficiency lies, Skyrim has a massive arsenal to choose from. Fighting the huge winged serpents that rule the skies remains one of the most entertaining and awe-inspiring aspects of Skyrim. For the first time ever, players can not only behold the majesty and ferocity of the fabled dragons, but they can battle them in a vicious duel to the death. There’s no one way to defeat a dragon, and like every combat scenario, players are free to use whatever tactics they see fit: mix things up by dual-wielding two destructive frost spells or stick with the classic sword and shield maneuvers. No longer does combat feel stale and dull as it did in Oblivion; rather than just a single power-attack, players can perform four different attacks by holding down the attack button and pressing up, down, left or right to execute a unique powerful blow. Dual-wielding is a great way to deal out quick and damaging blows. However players cannot block while holding two weapons. Players can also block with two-handed weapons, and even deliver a bash while holding block and pressing the attack button. This bash can stagger a foe and leave them open for a fatal strike, though the block bashes are much more effective when performed with a shield in-hand. Two-handed weapons such as great axes, warhammers and greatswords all do massive damage when utilizing power strikes, but these huge weapons deplete Stamina quite rapidly. A Dark Brother performs an assassination on an unsuspecting foe. Understanding how each class of weaponry works on the field of battle is very important and can be the difference between victory and defeat. Shields are recommended for gamers who like defend themselves and prolong fights, and dual-wielding is preferred by those who want to make quick work of their opponents. Bows are also highly advantageous to any player, and are best used in tandem with a high vantage point. Another new element that makes combat in Skyrim highly enjoyable is the fatal strike animations. When gamers deliver a death blow to any opponent, the game will sometimes feature a random animation in which the enemy is executed. These animations are very entertaining and give players a true sense of their character’s power. Players who sneak up on unsuspecting foes can also perform assassination animations that deal a critical one-hit fatal blow. Players who have a high skill level in One-Handed and Two-Handed can deliver high damage critical attacks and even perform grisly decapitations. Dual-wielding is another method of arms that can deliver destructive damage at a high rate, yet every fighting style is balanced with benefits and disadvantages so there is no “best” method. Instead, players are free to define what is best for their personal style– another reason why Skyrim fits all players like a glove. Enjoy a draught of mead at one of many local taverns in Skyrim. The myriad choices in weapons and armor featured in Skyrim are quite bountiful, giving players the opportunity to select from a huge variety of armors and weapons of many different grades and classes. Players will be relieved to find that condition is no longer a factor in a weapon or armor’s usefulness: repairing items is no longer a part of the game however weapon enchantments still degrade when used and have to be refilled with soulgems. Instead of just fixing an item’s condition like the Repair skill did in Oblivion, the new Smithing skill allows players to make any weapon or armor in the game and enhance their grade and effectiveness. The Smithing skill is very dynamic and requires various miscellaneous items such as ingots, leather strips and a proficiency in the skill itself. To smith items players must interact with a forge, and a workbench is required to upgrade armors whereas a grindstone upgrades weapons. There are two major types of armor in Skyrim: Light Armor (Fur, Studded, Elven, Glass, etc.) and Heavy Armor (Iron, Steel, Dwarven, Orcish, Ebony, Daedric, etc. ), each of which have their own unique properties and affinities. Armors can be affixed with magical abilities and enchantments, and can be found in various item shops and armories across all nine cities. To make exotic armor sets like Orcish and Elven, players must first have the required precious metals. There are many ore veins of different types are peppered across the caves and mineshafts of Skyrim. A pickaxe is required to mine ores, yet there are no restrictions or requirements to mine these expensive ores. Ore can be smelted into ingots at a smelter which can be found nearby at most of the nine holds. Oftentimes higher grade ingots also require ores of other metal types to create, and smelting high quality ore also gives a higher bonus to EXP in the Smithing skill. General Tulius of the Imperial Legion plans for war against the Stormcloaks. Players can also affix unique enchantments to armors and weapons, which is something that most Elder Scrolls titles have included. In order to enchant a certain item players must first harvest the specific spell from another enchanted item. For example, if a player would like to add fire damage to their steel axe, they would need to first disenchant a different weapon that is enchanted with fire damage. Using the Smithing and Enchant skills in tandem allows players to forge their own powerful sets of weapons and armors. It’s best to enchant base weapons and armors that have been upgraded to Superior with workbenches and grindstones in order to maintain maximum damage and defense from the items. Using powerful soul gems with grand souls also helps magnify the spell’s effectiveness on any enchanted item. Mastering the skill of Enchantment via the expansive constellation tree ensures creation of powerful enchanted armors and weapons. Daedric Shrines are also featured in Skyrim, offering quests that reward players with incredibly powerful unique weapons and armors. Many of these quests are difficult and challenging, however, and require a proficient and seasoned character. These shrines are a great way in earning unique weaponry and armor that can’t be found or made anywhere else in the game. Traditionally each Daedric Shrine corresponds with the twelve Daedric spirits, and each quest is a new adventure on its own. Mining ore with pickaxes is a new feature in Skyrim. Lockpicking has also been dramatically refined and now is practically the same as Fallout 3‘s –no longer must players be frustrated by Oblivion‘s finicky system. While the same general rules still apply where the Lockpicking skill determines a player’s success picking varying grades of locks, the mechanics have changed making it more user-friendly to all gamers. There are many entertaining small details to be found in Skyrim, many of which are attributed to the game’s many dynamic environments and miscellaneous in-game features. Engaging in activities such as chopping wood with a woodcutting axe or mining veins for precious ores with a pick-axe adds a new level of depth to gameplay. The crafting system–including the Smithing skill–gives players much to do while in between quests such as forging armors, smelting ores–like gold, moonstone and steel–into ingots, and even honing the edges of their blades with grindstones. Other small details involve Skyrim‘s vibrant environments and the incredible views, vistas and atmosphere. The many streams and waterfalls that snake throughout the Nordic fatherland are exceptionally detailed, and the current of the rivers can actually pull you downstream. To add to the beauty and realism, players can actually find salmon jumping upstream–and even catch them and cook up a nice filet. Players can also find butterflies hovering over flowers and dragonflies buzzing over marshlands–these small elements are quite charming to gamers new and old. The gates of Windhelm are a welcome site in the frozen tundra of the north. Climbing all 7,000 steps to High Hrothgar in the slopes of the gigantic mountain The Throat of the World is a majestic experience, laden with visual beauty that truly displays the level of incredible detail of Bethesda’s epic world. The atmosphere and day to night transitions are impeccable, and the starry nights remain even more breathtaking that Oblivion‘s with twinkling constellations, the boreal northern lights, and the twin moons frozen in the night sky. The interiors of locations such as caves have also taken a massive leap forward in terms of graphics, representation and overall feel. Every cave feels realistic and new upon entering, having its own unique formations and features. Unexplored caves can hold promising treasures like unique enchanted weapons or precious metals–but many times a den of bandits or fearsome outlaws will be guarding them. The interiors of the caves are incredible: the water is running and the rock walls look damp and musty, and the darkness makes every player light their way with torches. Whiterun is one of the first cities players come across in their journey. The nine cities of Skyrim represent the hub of Nordic culture with unique and awe-inspiring vistas and unique architectural formations. Every city has its own distinct look and feel that correlates with its region: Solitude, for example, is all ice and snow while Riften blazes with the golds and reds of autumn. Every castle tower and house is incredibly detailed and defined and the cities themselves thrive with townspeople and animals. The villages and settlements truly give Skyrim an undeniable charm that is rewarding and enjoyable. From the stone city of Markarth in the west to the Stormcloak capital of Windhelm in the east, the civilizations of Skyrim offer a bountiful array of visual splendor, quest opportunities, and a myriad of shopkeepers and vendors to buy items from. Each castle-city has a Jarl–similar to a lesser king or a mayor–that governs and rules over it within the boundaries of Imperial Law. Every hold is a work of art and the views during any time of the day are incredible, adding considerable beauty to Skyrim’s impressive fantasy world. The flow of Skyrim’s time cycles feels wholly natural and realistic. The sun rises and sets and hardly looks the same twice, giving a distinct visual feel for every new day. From expansive woodlands and golden rolling plains to the isolated frozen tundra where blinding snowstorms harry the ice, Skyrim is a title that delivers a truly magnificent visual experience. The legendary stone city of Markarth is believed to be carved from the slopes of the nearby mountain. At dawn, mist will form atop the myriad rivers and streams that stretch across Skyrim. The entire world flourishes with bountiful flora and fauna and everything from insects like dragonflies and bees to gigantic wooly mammoths. The environments in Skyrim are many and varied, and each of the nine cities give players a profound look of the Nord’s homeland in its entirety. The most recent Elder Scrolls titles have all been notorious for their exceptional musical scores. From Morrowind to Oblivion the soundtracks have improved in various ways, however Bethesda takes a giant leap forward with the musical score and sound effects in The Elder Scrolls V. The epic fanfare and rumbling shouts featured in Skyrim’s opening theme song truly imbues a sense of pride and wonder in players, stirring up emotions that hype gamers for the epic experience they’re about to behold. Skyrim’s soundtrack is a masterpiece in itself and perfectly complements the amazing visual experience: from the choir of Nordic warriors singing their ancient mantra to the in-game bards who sing of the Age of Aggression and Ragnar The Red, every single track is impressive and entertaining. The city of Riften depicts the golden hues of autumn. Gamers who played Morrowind will remember the cryptic and challenging aspects of its quests–half of the time gamers wandered around trying to decipher where to go and what to do. Guidebooks and FAQ’s help out with this, however gamers shouldn’t have to go out of their way just to figure out how to play the game. Skyrim abolishes this frustration as every quest and mission has a convenient and easy to follow point on the map. Simply select the quest within your Journal and press ‘X’ to locate the objective on the in-game map screen. Players can also explore the objective points on the more detailed Local Map that shows every nook and cranny of a selected area. The main quest of Skyrim is richly infused with lore that explores the heritage and origins of the Nordic race throughout their storied and bloody history. While there is an expansive amount of material that can be gleaned from conversations and books, it’s not something that is required to enjoy the game as Skyrim appeals to all gamers with its balance of rich fantasy with unforgettable action-packed combat. Gamers go through a point of complete transformation throughout Skyrim that is very satisfying: players start off as unsuspecting prisoners and end up as one of the most powerful forces in all of Skyrim. Becoming the legendary Dragonborn and using the ancient power of the Thu’um is an incredible experience for Elder Scrolls fans new and old. Pray to the Nine Divines at temples to cure all diseases and receive blessings. The flat parchment map featured in Oblivion has been abolished–Skyrim features an incredible high-definition 3-D map that truly depicts the Nordic homeland the way it should be represented. The various cities such as Whiterun, Riften and Markarth are shown with icons, keeping the traditional system, yet the new map is enjoyable every time players view it. The Local Map gives a more distinct and specific view of a player’s current location, however it’s shown in monochrome instead of color like the full map. Fast-Travel is still in, yet venturing on foot throughout Skyrim isn’t as slow-paced as it was in Oblivion or Morrowind. Players can make impressive time with the new sprint ability which is activated by pressing ‘LB.’ Sprinting drains your Stamina, yet it’s quite efficient and is incredibly useful in any situation. To speed up on-foot travels, gamers can purchase horses from a stable found at any of the nine holds of Skyrim. Fast-Travelling works the same way it did in Oblivion: you can’t fast-travel while over-encumbered, while in battle, and you can’t travel to an area that you haven’t discovered yet. As most of Skyrim’s holds and cities are spread far apart from one another, players can pay a carriage to take them to various nearby holds. Using a carriage doesn’t require the destination to be previously visited, so it’s a great way to cross the huge distances between the many cities and locations. Vex is a fellow member of the Thieves Guild. NPC’s have an entirely new dynamic system of interactivity that brings every character to life. No longer do shopkeepers stare at you blankly as they did in Oblivion, or stand around like statues as they did in Morrowind: the AI is radiant and each character has their own schedule. Shops close at night and many of the denizens of any given town can be seen drinking and dining in local pubs…and even sleeping in their beds. Engaging conversation with an NPC in Skyrim is actually entertaining as each character is visually distinct with realistic body language. What’s even more impressive is that each NPC has their own unique accents–as Nords, many of Skyrim’s denizens will have strange pronunciations and emphasis on certain speech patterns which is accustomed to their northern heritage. There are many factions and alliances in Skyrim that players can join, many of which have been included in other Elder Scrolls titles. All factions have exclusive and dynamic questlines that not only forge a player’s path but offer rewards like unique items and gold. The main factions include the Companions, the archmages at the College of Winterhold, the Thieves Guild, the Dark Brotherood, the rebellious Stormcloaks, the lawful Imperial Legion and the Thalmors of the Aldmeri Dominion. Ulfric Stormcloak sits atop his throne as Jarl of Windhelm. Warriors can join the Companions–which is basically like the Fighters Guild–at the mead hall Jovaskr in Whiterun, whereas mages and sorcerers study the art of magicka at the College of Winterhold. For pickpockets and stealthy characters the Thieves Guild operates out of Riften’s seedy underbelly known as the Ratway. There are also followings and cults such as the Forsworn that dwell in the dangerous wilderness of the Reach. Bandits, outlaws and mercenaries are also commonly seen throughout the wilds. The guild known as the Dark Brotherhood is an exclusive faction that seeks out skilled assassins to join their ranks. Political factions such as the Stormcloaks and the Imperial Legion require players to make a choice between one or the other, and the treacherous and powerful Aldmeri Dominion can’t be joined at all. The Elder Scrolls V: Skyrim is the definitive and ultimate Elder Scrolls adventure, delivering a truly unforgettable and epic fantasy experience like no other. Skyrim is a deeply intimate and profound singleplayer experience that imbibes a true sense of epic heroism in all players, and truly represents the hearty Nordic culture in its entirety. Entering the thriving and beautiful world of Skyrim is something that players won’t want to miss out on, and it’s easy to lose hours in the incredible vistas and Nordic cities spanning across the land. With well over 300 hours of available playtime, Skyrim is a title that players can fully lose themselves in and not even scrape the surface of the massive scope of the game. It truly is an experience that all gamers can behold and enjoy in their own way as it offers full character customization and allows gamers to engage themselves in a historic adventure that will shape the fate of the Empire and all of Tamriel. Skyrim is a feast for the eyes and ears as it brings breathtaking visuals that span across a unique and engaging world, and a musical score that defines the word epic.